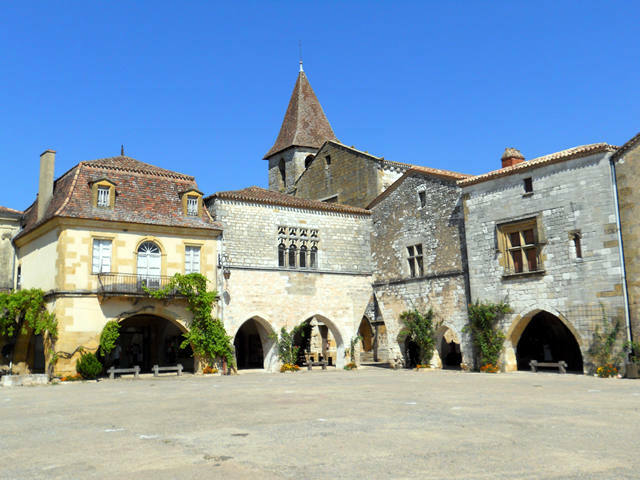 Monpazier, “the most perfect bastide”, (which is a fortified town), designed in a neat rectangular grid around an arcaded square with a market and church is one of “Plus beaux villages de France” with 32 listed buildings. 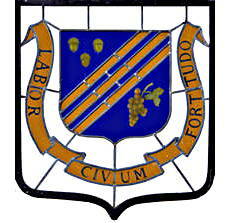 It was founded late as bastides go, in 1284, by Edward 1 of England. 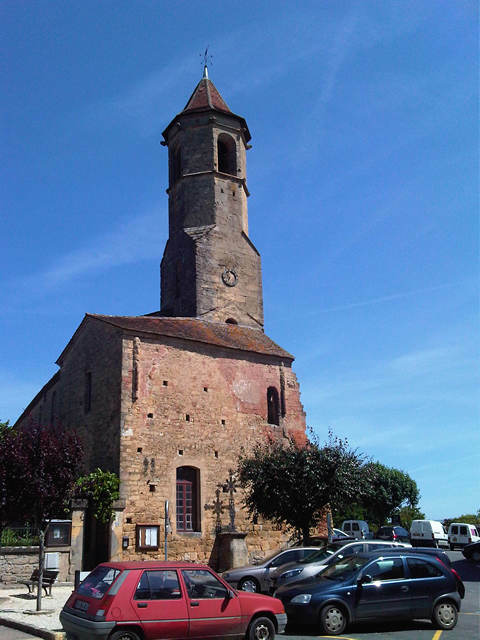 It prospered long enough to have a perfectly rotten 14th Century, when the town was a football which was kicked around during the Hundred Years War, then came bad harvests, typhoid fever, and finally the Black Death. 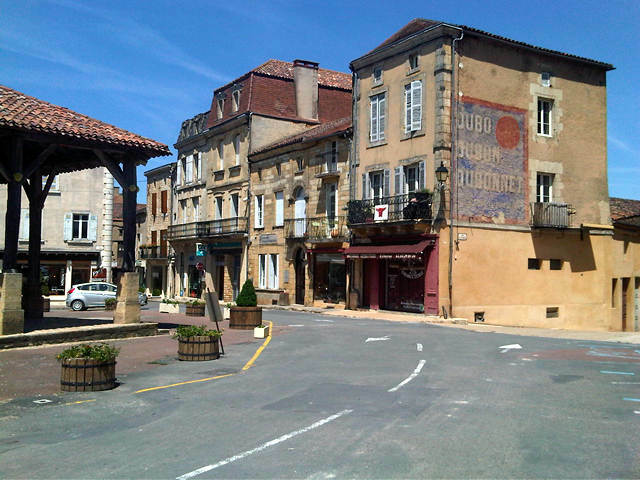 However, life in Monpazier continued. 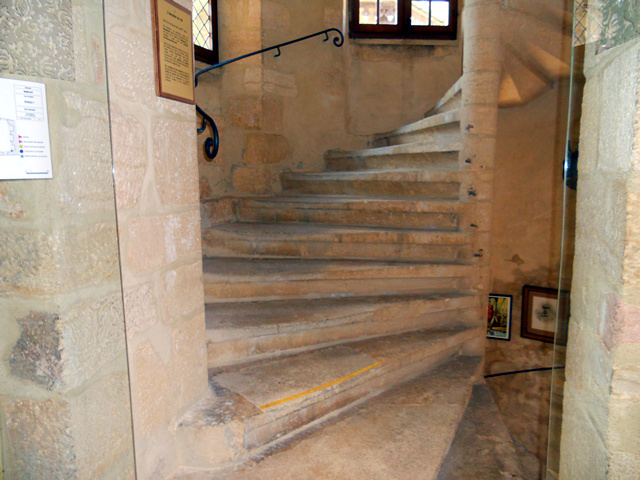 It was during the next round of warfare, over religion, that the Duke of Sully recorded a story about Monpazier which is worthy of a Monty Python sketch: by sheer coincidence Monpazier decided to raid Villefranche-du-Perigord, the next bastide to the east, on the same night that Villefranche decided to do the same to Monpazier. By chance each took a different road; each was delighted to find their goal undefended and easy plunder, and carried its booty back-to ransacked homes. An agreement was struck, and both sides gave back everything that they had stolen and peace was restored. 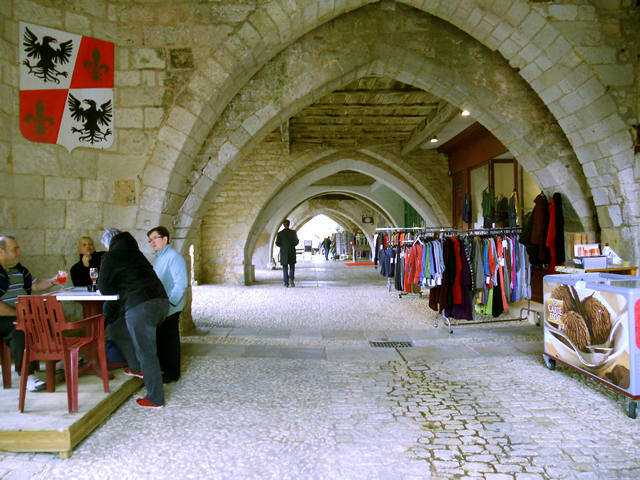 Note that the regulation cornieres, or arcades around the square are irregular. 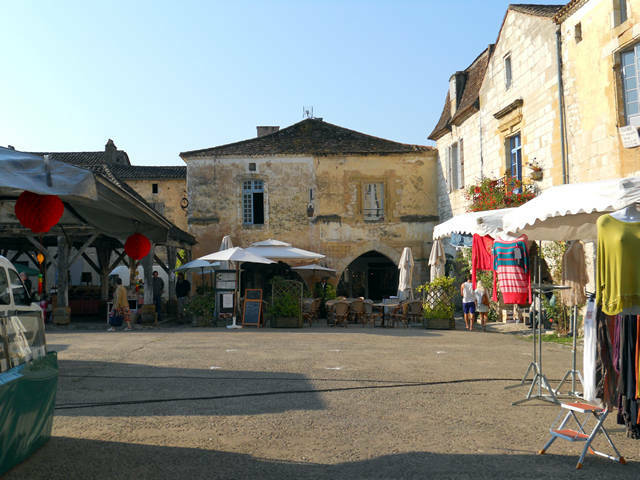 Every time we go to France we plan our next visit to Monpazier, it is always worth a visit, especially on a Thursday, market day. 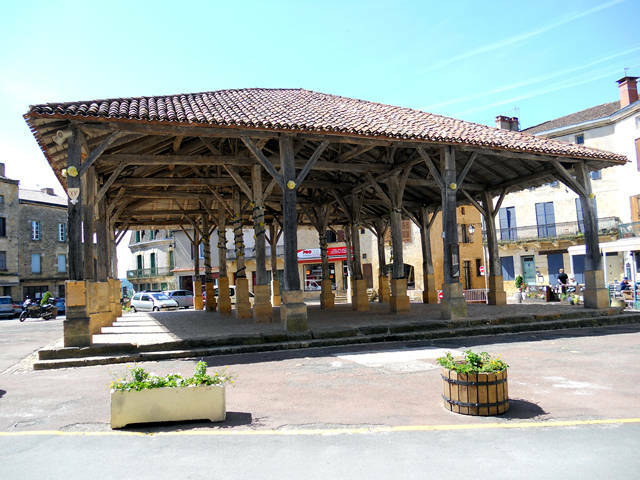 You can see the gorgeous vaulted ceilings as you walk around the square. 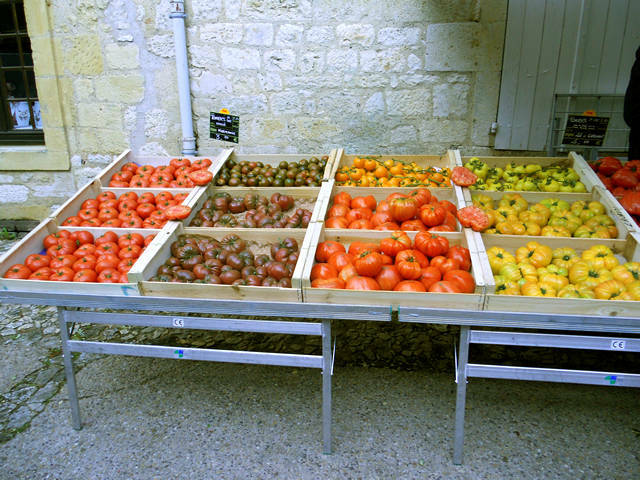 Just look at the variety and size of the locally grown tomatoes, they tasted good too. This was taken just off the market square. 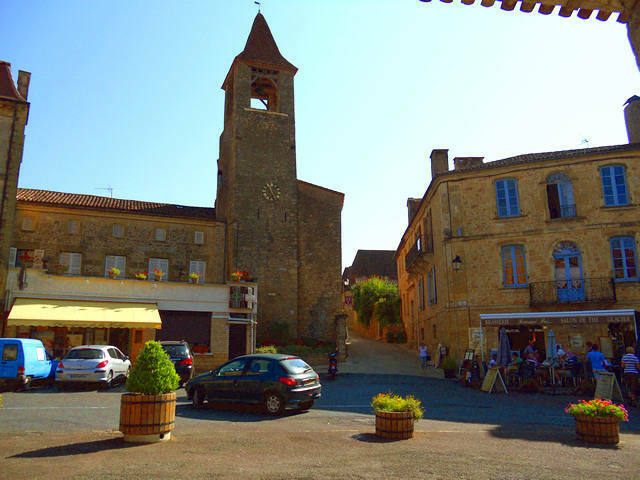 From the town square you will see a bell tower with a clock on the side, go to the side entrance and you will find the tourist office. 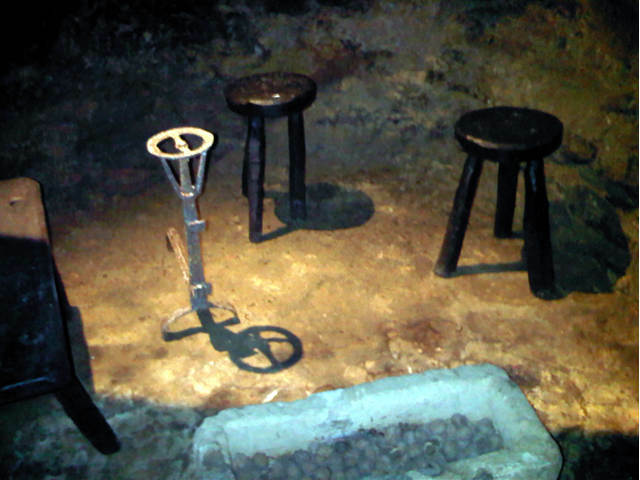 Here you buy your ticket and arrange a tour guide to the caves. 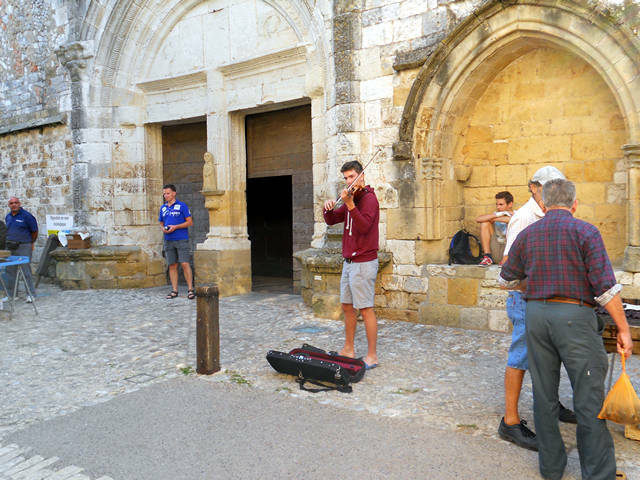 We joined a large tour that was just about to leave, you can not go to the caves unless it is with a guided tour of people. 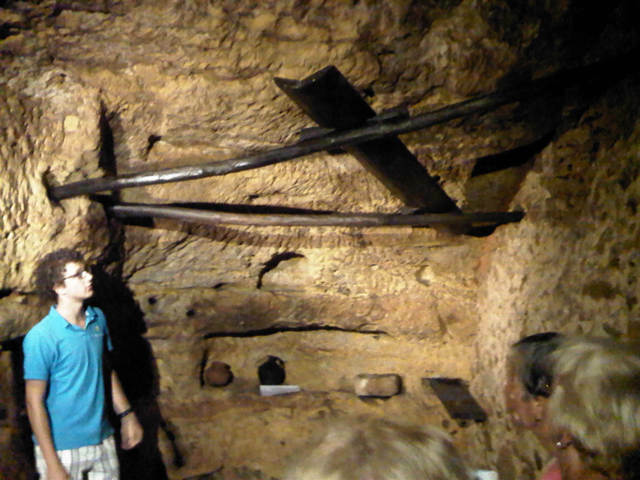 The cave dwellings are where the poorest people lived between the 13th and 18th Century. 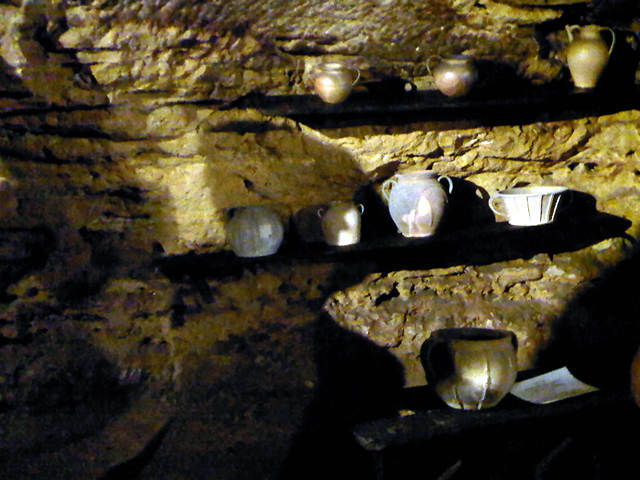 You can see the interior of eight cave dwellings on the guided tour. 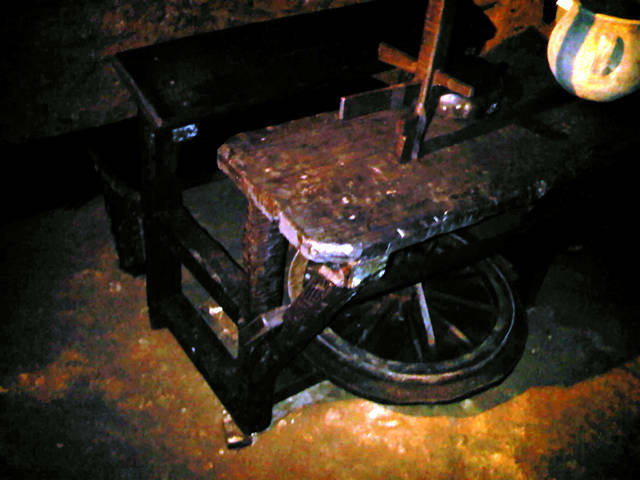 Light is at a premium so you can just see if you squint a little, the spinning wheel which was used in one of the caves. A large fireplace where people cooked and sat around for warmth. This is a water system that was used in one of the later caves. Water was gathered from the water which would seep from above ground to trickle along the wooden tough and drip into a container below. 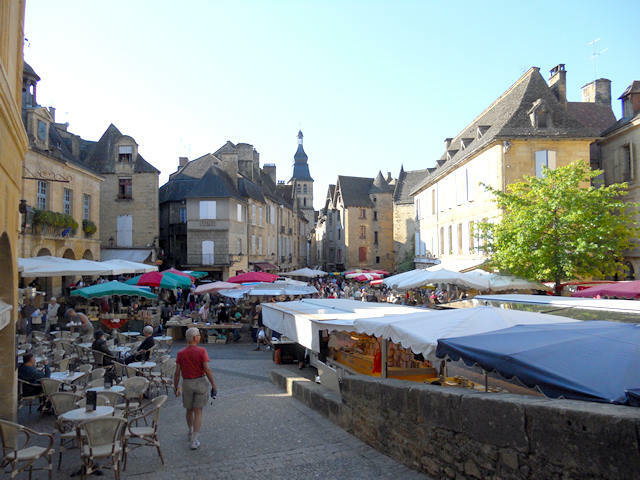 Market days in Sarlat-la-Caneda are tremendously busy but a must to see, Wednesday is mainly for food and Saturday for the main market which incorporates food, clothes, shoes, antiques, tablecloths etc. 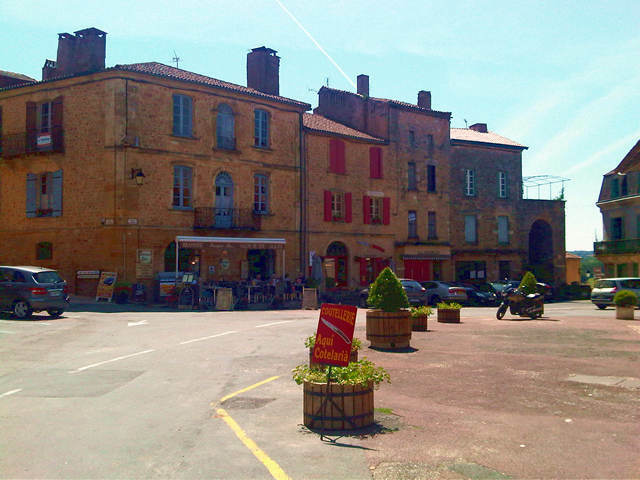 The Market runs down the main shopping street (Rue de la Republique) and the medieval quarter including the Place de la Liberte. This is a picture looking down to the market in the Place de la Liberte from the steps. 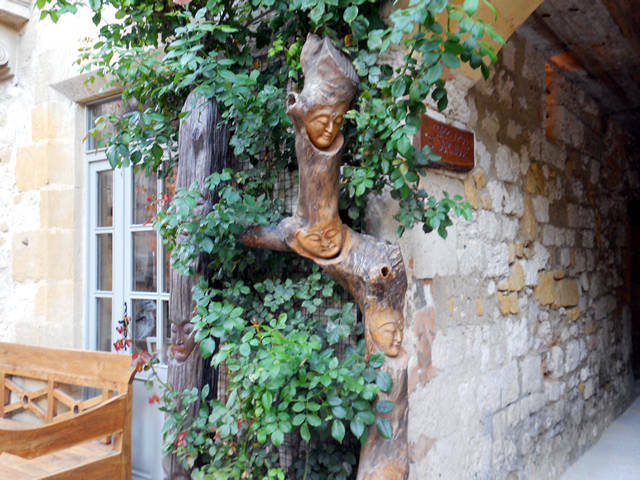 There are several café’s dotted about so it’s a great place to stop and buy a coffee and watch the world pass by. 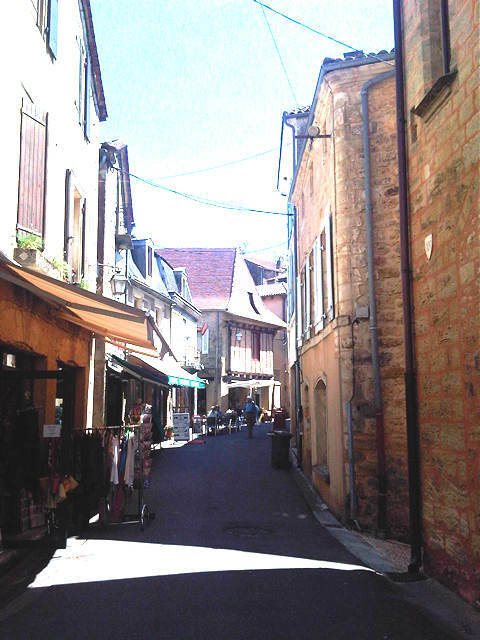 The French law on the restoration of conservation areas was first introduced in Sarlat, resulting in many listed building and monuments being saved. 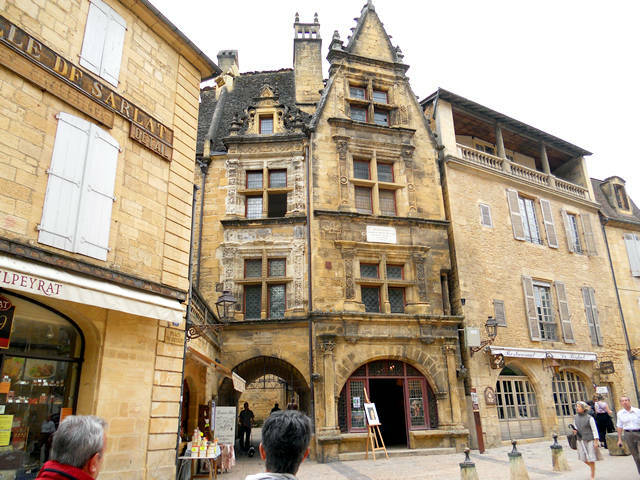 An example of the many wonderful architectural buildings of the medieval period to be found in Sarlat. 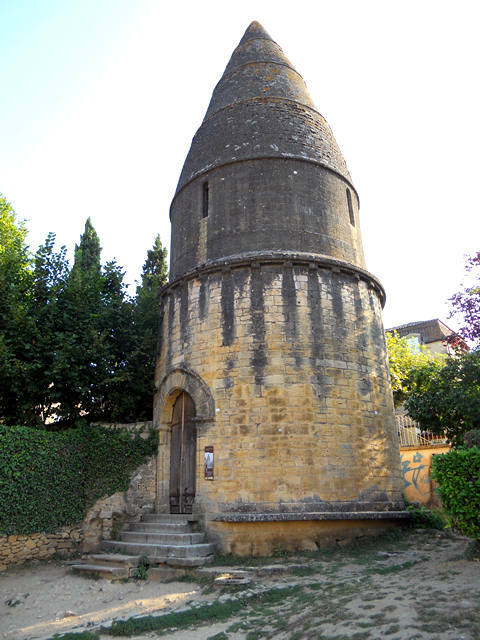 architectural buildings of the medieval period. 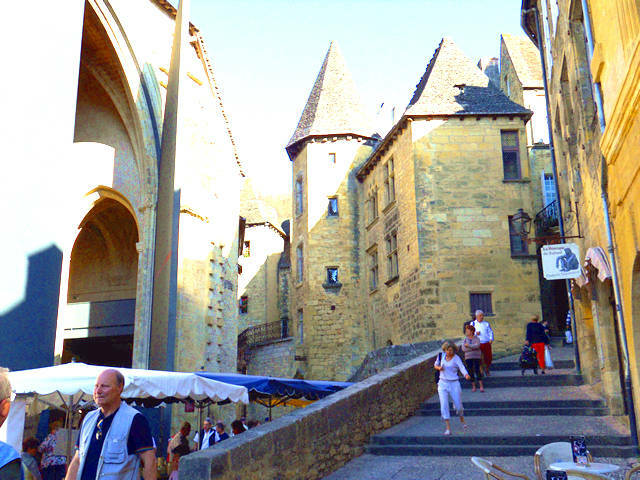 During the summer months Sarlat holds several festivals that spread throughout the streets of Sarlat. 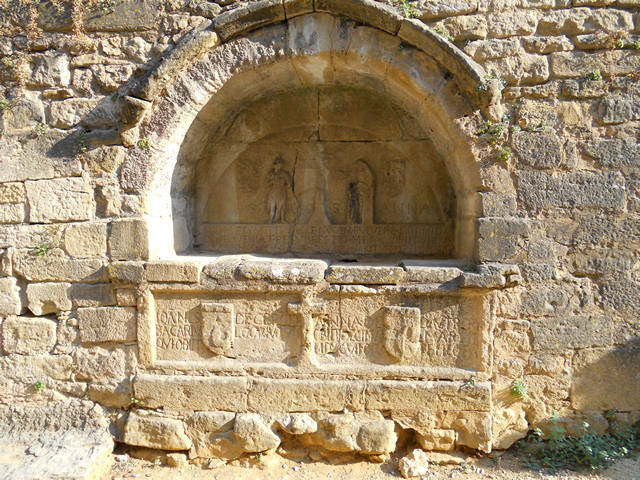 To the right of the lanternes des morts is a natural amphitheatre where concerts are held. 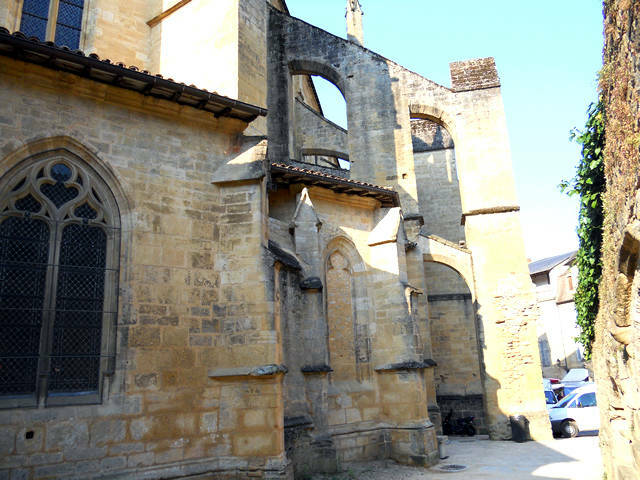 notice the massive buttresses which are not so obvious from the front. 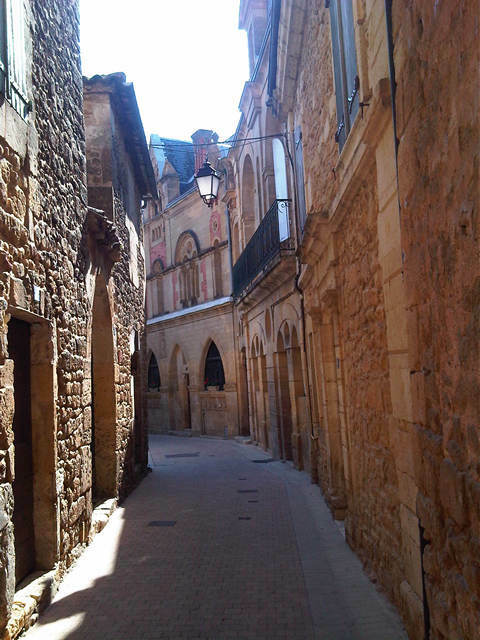 In the stone wall at the left hand side and rear of the cathedral there are several medieval tombs. 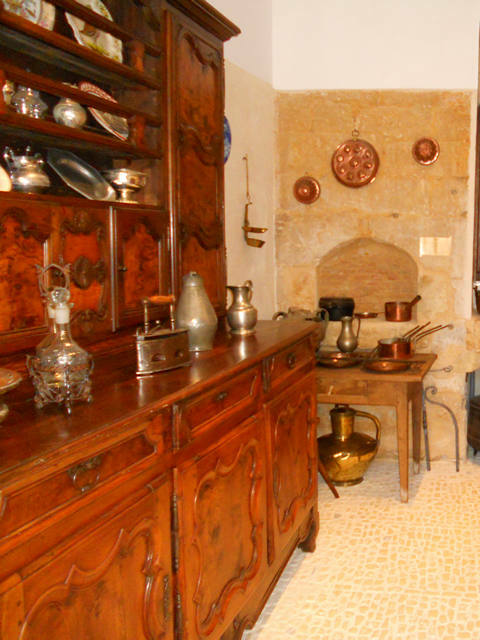 The Manor de Gisson, is a listed building in the protected old quarter of Sarlat and is well worth a visit. 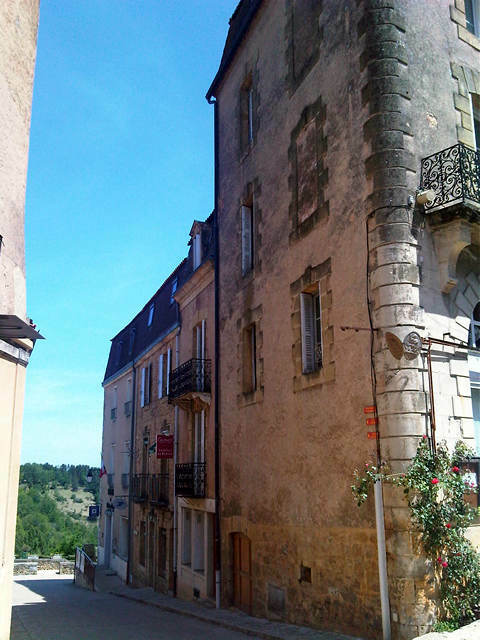 It is to be found at the top end of the Place de la Liberte, just past the indoor market. 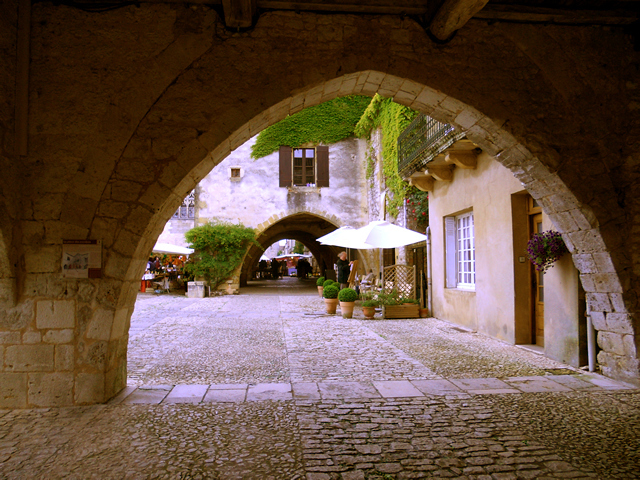 You will pass the massive doors on the left that lead to what was the ancient church of Sainte-Marie which is now the indoor market, selling the most delicious macaroons you have ever tasted. 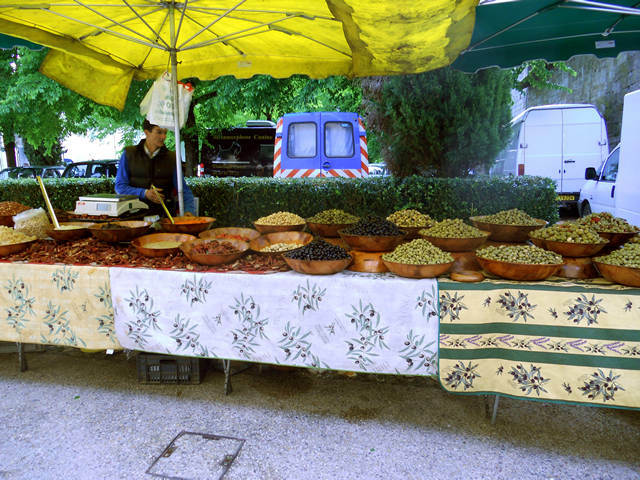 The walnut stall sells walnuts covered in toffee or chocolate, other stalls sell cakes, local wines and cheeses etc. 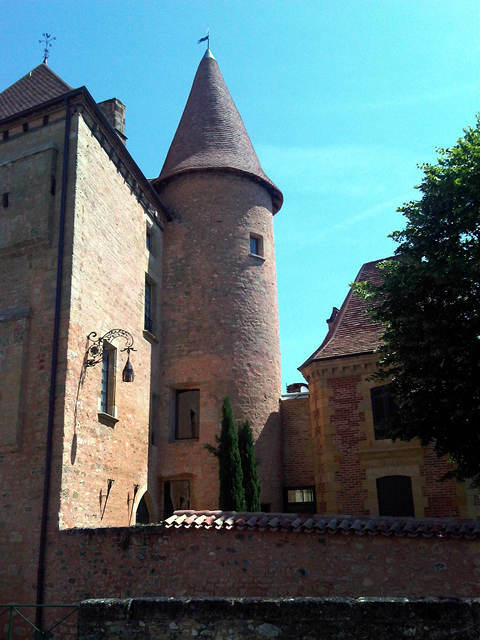 The Manor De Gisson is formed by two constructions of different architecture, linked with each other by a grand spiral staircase inside a hexagonal tower, which dates back to the 13th century. 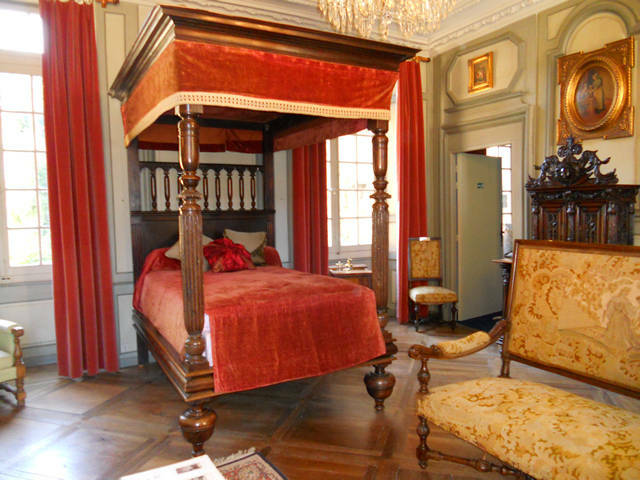 There is much more to see including “the terrasse”, which overlooks the indoor market, “the grand salon” depicting domestic luxury at the height of 17th century and the “strange cabinet of curiosities”.